In part 1 of this update, I discussed the changes to the landscaping I’ve made to the Horizons model to improve its accuracy. 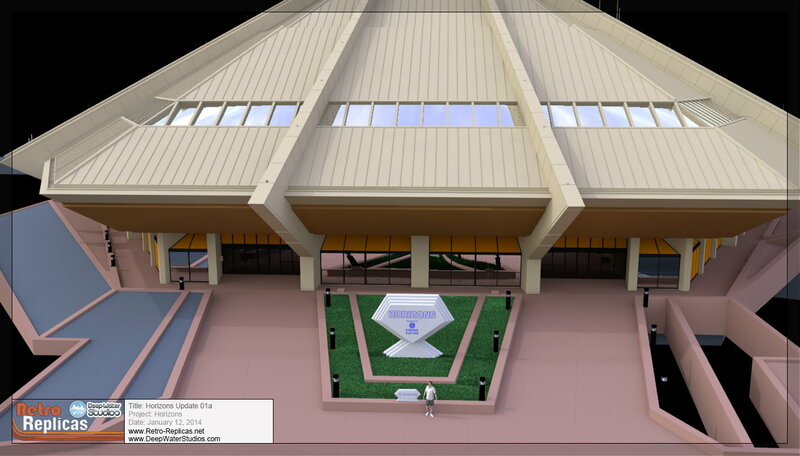 In this part, I’ll explain the changes to the Horizons pavilion building I’ve made so far. 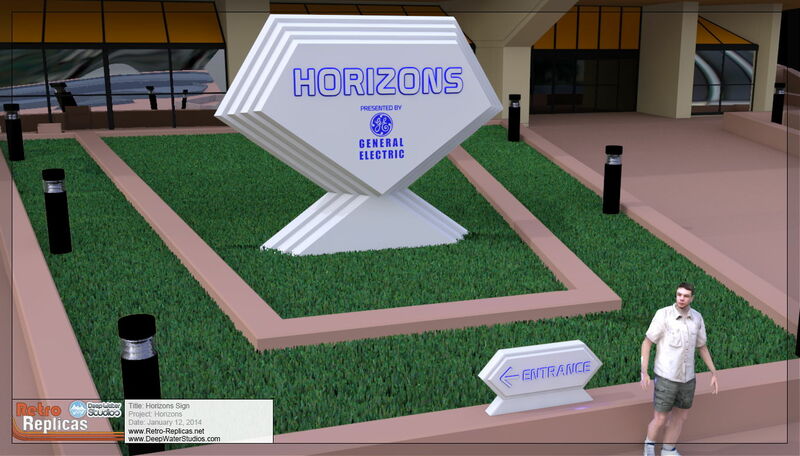 Luckily, most of the changes I’ve made and plan to make to the model of the Horizons building are minor and are mainly adding more detail and optimizing the mesh for later use in the model making process. As you can see from the little guy (6′ tall), the pavilion was huge. This is what will make it very difficult to adhere to most model railroading scales. 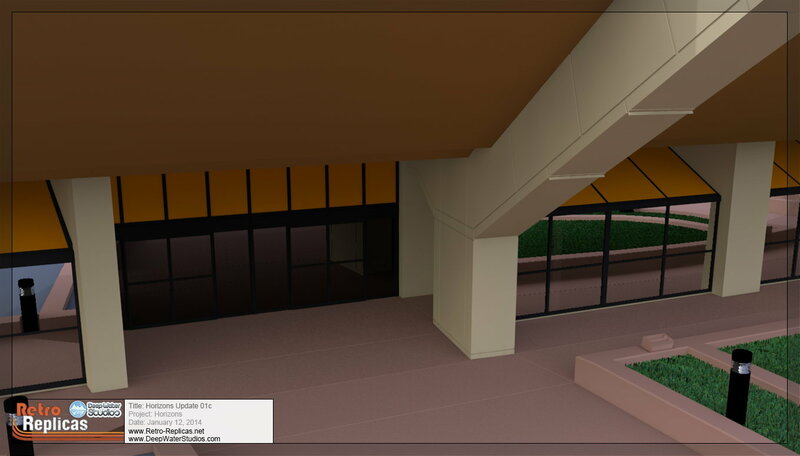 You can also see the rebuilt landscaping curbs and walkways around the building in the rendering on the left. I also rebuilt each of the walkway lights and included some light objects for a later night time rendering. I’ve left most of the texturing off of the new model objects as it’s not necessary for the production of the prototypes and it’ll save time. After the model goes into prototype production I can go back and create material shaders to finish up the look of the model. 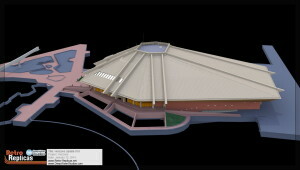 Due to the size of the final physical model, some of the details found in the virtual model may not make it into the physical production version. The details would simply be too small to replicate. 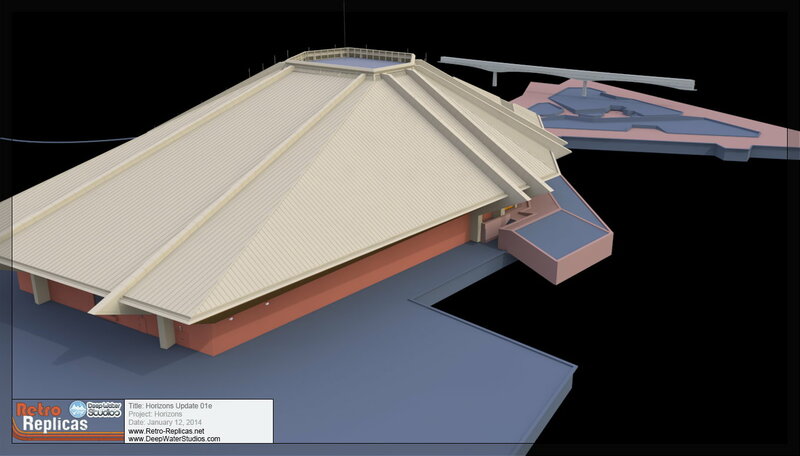 But because with the 3D virtual model I can zoom in as close as I want, I’ve included a good deal of detail. Some of these details, such as the concrete expansion joints are useful in determining the placement, size and orientation of other parts of the model so they serve multiple purposes. The Horizons sign is one of those features where I’ve included detail in the virtual model that is likely to be not as detailed in the final physical model. But it had to be accurate and complete for any renderings to look right. 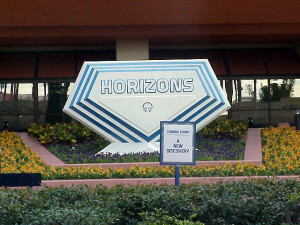 The Horizons sign went through several versions through its life starting with the version you see in the rendering on the left. This is how the sign looked when Horizons opened in 1983. At some point after this the words “General Electric” was dropped from the sign. I’m not sure why, it may have had something to do with GE updating their logo in 1986. The version in our model is the 1969 version of the GE logomark – the one that would have been in use when Horizons opened. 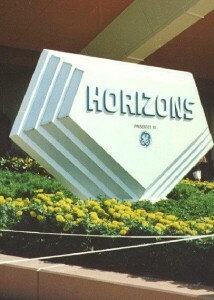 And of course, when GE didn’t renew their sponsorship of Horizons in 1993 all reference to GE was removed, and the sign was once again changed. Most of the work I’ve done on the entrance was to add detail to the framing surrounding the doors and windows along with cleaning up the geometry. As the model has been through a couple different software packages now, the objects had gotten a little messy and need some cleanup. If you look really, really close you can see some of the concrete expansion joints along with the new pavilion lights. The pavilion lights were spotlights pointed up at the bottom of the pavilion roof and used to light it at night. These are new to the model and are there in case we want to light the physical model. We can add the lights to them and light the model exactly as the real pavilion was. I’ve even angled them and checked them with virtual lights to make sure they are aimed properly. I haven’t done too much with the rest of the building yet as I believe it’s pretty accurate. There may be some tweaks to the backstage areas but probably not much as I don’t have a lot of backstage reference material. You can see a glitch in the roof on the South side that appeared somewhere in the export/importing process so that’s something I have to fix. I also have to rebuild the numerous lightning rods located along the roof. And of course, I have to build the remote camera that was located on the roof. 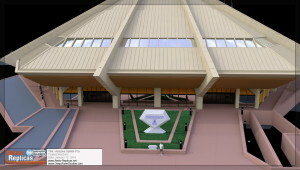 So I plan to finish up the landscaping then finish up the work on the building. Then it’s off to Todd for building the prototype. Keep an eye on the site, our page on facebook and our twitter account for update announcements. This is a-ma-zing!!!!!. Great work on one of the most spectacular buildings/attraction that Disney World ever had. Cant’ wait fot the next update!